Darjeeling returned to normal on Monday but with subdued apprehension after Sunday’s undeclared bandh in protest against the issue of arrest warrant against 23 Gorkha Janmukti Morcha (GJM) leaders named in the CBI charge sheet by a Kolkata court in the Madan Tamang murder case. Hill residents went about their business as usual but with some amount of uneasiness even as the para-military and police forces did the round of the town areas in the morning and evening, to help calm the nerves of the people. Throughout the day GJM activists from different areas of the hills made their way to Malidhura, eight km from town, to meet party chief Bimal Gurung and pledge their support. Gurung and most of the senior leaders of the party have been named in the Central agency’s charge sheet. Media persons were not allowed to attend the meeting between the GJM leaders and supporters. Sources however said that Gurung had asked the assembled people to maintain peace. “We have conducted pujas and have full faith that we will be able to get over the present tide. I appeal to all of you to maintain peace and discipline,” the GJM chief is said to have told the large crowd that had gathered at Malidhura, which is one and half km from Gurung’s house situated at Patleybas, since morning. The source said for the coming 10-15 days, party workers from different areas of the hills would continue to come and meet Gurung in Darjeeling, to extend moral support. GJM had organized a seven day long “Chandi Puja” at Jumuni in Darjeeling from May 30. The CBI on the other hand had filed its final charge sheet a day earlier in the Kolkata city and session’s court, seeking warrant of arrest against the GJM leaders. The city and session’s court on Friday had directed the CBI to execute the arrest within 20 days. GJM assistant secretary Jyoti Kumar Rai and the party’s legal cell member Tilak Chandra Roka are in Kolkata to apply for an anticipatory bail for the accused in the High Court on Monday. 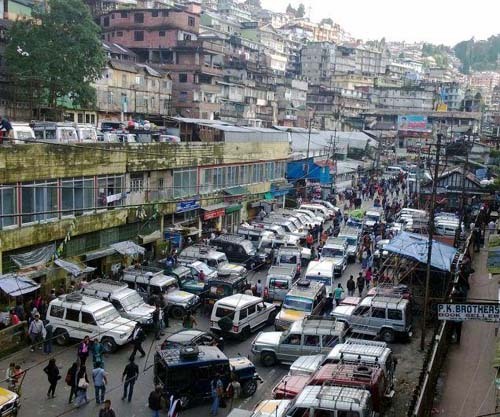 Amit Javalgi, the Darjeeling superintendent of police said after Sunday’s bandh things were on track on Monday and adequate forces were available to maintain law and order. “Yesterday, the traders shut shop because of panic. But today things are normal and we intend to keep it this way. In fact, the GJM has understood that it is a matter of the court. This is the reason why we did not have any kind of trouble in the last couple of days,” he said. Hoteliers and tour operators are keeping their fingers crossed with the uncertainty still looming over the Hills. “We have not received any cancellations, yet. Yes, some tourists did leave on Sunday in panic a day earlier than their duration of stay. 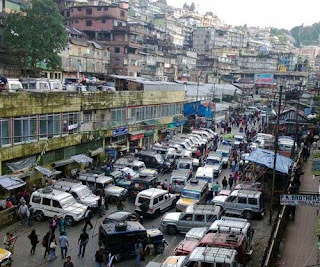 However, we feel the district administration should make some kind of announcement through the public address system or posters to assure tourist that things are normal,” said Pradeep Lama, general secretary of Darjeeling Association of Travel Agents (DATA). The All India Gorkha League (AIGL) said it would write to the state government to request that the peace and law and order of the hills is maintained. Meanwhile, the AIGL general secretary Pratap Khati on Sundayaccused the GJM of threatening the 100-odd witnesses related to the case, following the issue of the arrest warrants. “Threatening posters are being put up. As soon as the news of the arrest warrant was public, the GJM has started its terror in the hills,” Khati stated. He also accused the GJM of forcefully conducting a strike in Darjeeling on Sunday. Speaking to reporters at Siliguri Journalist Club, Khati also accused Gurung and the GJM vice-president Roshan Giri of going against the court’s order and making their passports. He even provided the passport numbers of the two leaders. Putting a question on the two leaders’ integrity, the ABGL leader questioned Assam Arms case accused Sabhasad Sanjay Thulung’s absence and Gurung and Giri’s frequent visits to the northeast region. He also urged the state administration to make its move at the earliest so that the accused did not get a chance to escape. Khati also lamented about the declining number of tourist to the hill destination due to the uncomfortable situations created in the hills time and again. “The people of the hills are not with the GJM, they are only scared to speak in open. The GJM leaders and supporters started their activities to terrorise the public and threaten the witnesses on Saturday itself. We have already written to the state governor demanding protection to the witnesses,” he claimed. Demanding justice and urging the state government to act quickly and conduct a fair trial on the issue, Khati stated that those named in the arrest warrant should not be allowed to run the regional administration.